Moving your business can be a complicated process, and these helpful packing tips will ensure you stay on track and within your planned timeline. All preparation and labeling should be done before moving day. 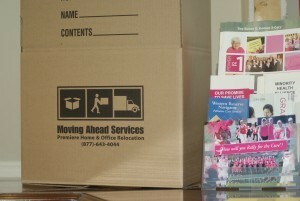 On the day of your move, only essential move planning team members should be on site. Packing, labeling and organizing should all be done before the day of your move – this may be completed by your team or by ours, depending on your contract. Office Desks: All desks should be emptied prior to your move. Small items should be put in bags or envelopes. Filing Cabinets: In most moves, file cabinets do not have to be emptied. Adjust internal components to keep items in place, and lock the cabinet doors if possible. Be sure to secure the keys in a safe place. For push locks it is important to avoid accidentally locking it during your move. If locks are not available, secure with the appropriate tape. Book Cases and Shelving: All items in book cases or on shelves should be packed. Supply Cabinets: All items stored in supply cabinets should be packed and cabinet doors should be locked or secured. Printers and Scanners: Do not pack printers or scanners! Equipment should be serviced the day before the move to empty out any liquids. Keep cords and any parts together in a bag or box. Leave any printers, scanners or other small equipment out in the open for our movers. Wall Décor: For DIY packing remove any items from the walls and pack in appropriate containers. Computers and Phones: All computers should be backed up for data protection prior to your move. All cords and parts must be secured separately and appropriately labeled. Employee Items: Employees should plan to pack and move their own personal items unless your contract and plans specify otherwise. Every single piece of furniture, equipment or box should be labeled for location and contents. This includes multiple pieces from furniture, etc. In your planning phases, be sure to draw out destination lay out plans to aid in labeling and organizing during the packing process. Next, view our moving checklist for office moves! Ensure your business has a smooth transition. Professional local and long distance moving company in Ohio.